A premium, greenhouse-grade tomato fertilizer for tomatoes, squash, cucumbers, eggplant, peppers, and melons. In the fruit development and maturation stage, big vegetables want less nitrogen and more phosphorus, potassium, and calcium. This produces large, sweet, flavorful vegetables of the highest, gourmet quality. Typically used from fruit set on. 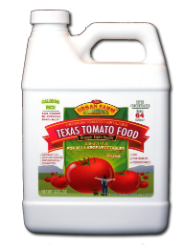 Best to start young plants on All-Purpose Vegetable Fertilizer and switch to Texas Tomato Food after fruit set. All Urban Farm Formulas are designed to produce stunning results in soil and potted plants, as well as hydroponics. Urban Farms has demonstrated that humic acid, bat guano, sea kelp, earthworm castings, and enzymes in the correct ratios and concentration add significantly to metabolic processes and the uptake of nutrients. Their formulas are the result of years of ongoing side-by-side trials and tissue analysis.